The classic black tuxedo will never go out of fashion. Every year new styles appear but the black tuxedo is an everlasting symbol of elegance, grace and sophistication. If you wear black formal wear, it need not be traditional. Show off your style with a choice of colorful vest and ties. Gold accessories are particularly striking when matched with a black tuxedo.Black tuxedo is the right choice for any formal wear occasion. Mensusa have latest collection of black tuxedo for sale as well as for rental in discounts that are useful for wedding occasions. Black Tuxedos are timeless and classic. Black tuxedo is a classic and will never be out of style. Single breasted, three button tux is made of Super 100's grade of wool. This tuxedo features satin notch lapels, three button front and a single breasted; one button tux is made of Super 100's grade of wool. If you're looking for formalwear, get the entire package of men's Tuxedos. 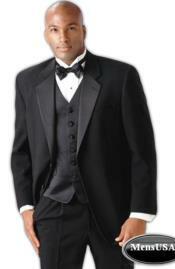 Entire tuxedo set including shoes can get great-looking formalwear for special occasion. Tuxedo or tailcoat, in range of colors - dark for fall and winter, pastels for spring and summer, black for any time of year. Shirt black or coordinate with tuxedo in color may be pleated or flat.